It’s a mystery to me why a remake of a mildly successful movie would be attempted. This production directed and executive produced by Catherine Hardwicke is an example. 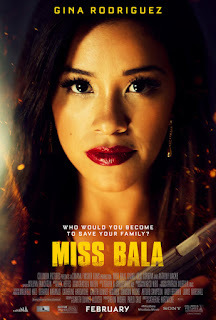 The previous Miss Bala (2011) received some recognition after its premier at the Cannes Film Festival, but did not win any significant awards. Nevertheless, it was regarded more highly than this version is likely to be. Both are based on an actual event that occurred in 2008 when a beauty pageant winner in Mexico, got mixed up in a drug trafficking scandal. In 2019’s Miss Bala, Gina Rodriguez as Gloria, a makeup artist, returns to Mexico where she grew up to visit her old friend Suzu (Christina Rodlo), who is competing in a contest to become Miss Bala of Baja, California. They’re thrilled to be together again and decide to go to a club in the evening where the mayor is supposed to be. Suzu tells Gloria that he is influential in the contest, and she wants to make contact with him. She does indeed, and introduces him to Gloria. The evening is cut short when the club is terrorized by gang members shooting it up. The two women are separated, and although Gloria survives, she can’t find Suzu. What follows is a series of mishaps in Gloria trying to get help, and instead, getting abducted, not just once, but twice. The first time is by Lino (Cruz), the leader of the Estrellas gang, who eventually promises to help her find Suzu IF she will do something(s) for him. The second time is by a DEA agent (Lauria) who wants her to help him locate Lino. Each man places her in a double bind so that she is forced to help both of them—a real dilemma. There are some exciting, interesting scenes and plot twists, but these are weakened by illogical and implausible situations and actions, some simply going against common sense. An example is when the club is attacked and bodies are falling all around her, Gloria does not lie on the floor and play dead. She risks her life by running through a barrage of bullets, and then puts her trust in someone who betrays her. Another is when Gloria becomes an expert shot with an AK 47 after one lesson. A major issue for me is when a DEA agent (Lauria) is portrayed unfavorably as compared to Lino, who is shown at times to be heroic and respectful. Not to say that DEA agents are all fine and upstanding, but this portrayal seems to come from a bias against them. The main actors (Rodriguez, Mackie, Cruz, Lauria) hold their own in terms of skill and being convincing; Rodriguez and Mackie, especially so. Probably the weakest aspect of the film lies in the script by Gareth Dunnet-Alcocer that stretches plausibility. Catherine Hardwicke’s direction seems well measured with a good sense of timing. For viewers looking for an entertaining two hours and willing to accept flaws in the plot, this is an OK movie. A novel twist on a beauty pageant mixed up with drug trafficking.